Q. What made you want to attend Catholic Youth Expeditions? A. My first time going was in April 2016 when I was a sophomore. I actually vaguely knew about CYE as my older cousin had gone quite a lot when she was in high school. A friend of mine had been forced by his mom to go the month before, and loved it so much (ha, mom was right) that he got together a group of friends to go. I thought, “Well, what harm can there be in going on a retreat for a weekend?” so I signed up. Q. What is your favorite part about the Expeditions? A. It’s really hard to quantify what makes them so fun. I would say that one of main reasons I keep going is for the camaraderie. When you are there, you are totally separate from the world. But when I’m there, it’s like another home, with people that I usually only see on expedition. But some of them have become very good friends. The sisters, staff and father are so incredibly welcoming, you really understand what the “family of God” means. Q. How has Catholic Youth Expeditions made an impact on your life? A. I’m sure many of the people who will read this will have been to a Steubenville conference or a retreat of some sort. One of the biggest impacts is that usually every other month or so I can have that type of experience again. Adoration and confession [are some] of the highlights every trip. CYE also really introduced me to the liturgy of the hours. I didn’t really know what it was before, so this really got me interested. The “universal prayer for the church” is really cool. Did you know that it is the second highest form of prayer in the church, right after Mass? Yup, even above the rosary. It’s a really good way to start reading and interacting with scripture, and to form a foundation for a personal prayer life. Q. 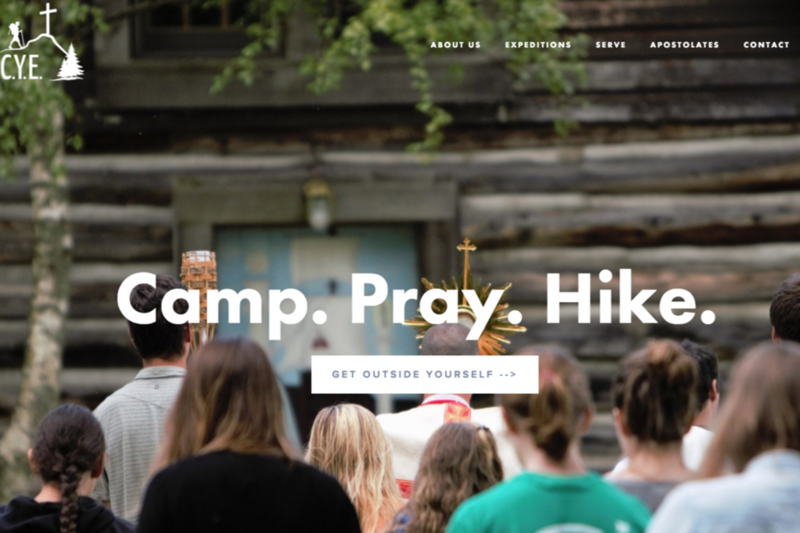 Why is Catholic Youth Expeditions different than other retreats? Would you recommend Catholic Youth Expeditions? Why? A. CYE is totally different than any other retreats. Well, first, according to father, “It’s not a retreat, it’s an expedition!” I like to say that if you aren’t eating or sleeping, you are either outside or in the chapel. It’s not a traditional “retreat” because you do lots of crazy and fun stuff. Some of that has included going cliff-jumping, a ten-mile (with Mass on a rock in Lake Michigan to top it off), and lots of random ideas father comes up with. Another reason CYE is very different are the people that are there. It is the home of the Missionaries of the Word, which is an order that was founded by Mother Mary Katherine, who was actually Mother Teresa’s driver for a couple years. They have a very unique calling to serve young adults. Father Quin Mann is the chaplain up there, and he is definitely my favorite priest ever. Someone who can water ski, is fascinated with new technologies, owns a one-wheel, has a sheep-dog at his beck and call, and can relate to young people… One time he gave an entire hour-long formation session on an article about a failed rocket launch and pilot ejection, and how that can be a metaphor for our spiritual lives, etc. Q. Could you give an overview of what the weekend looks like? A. Every expedition starts at “base camp,” which is a part of a strip mall in Green Bay. We take a bus up to the retreat center. In the winter we arrive in the evening at the retreat center, in the summer we get there at about noon. Wake up is at 7:00, and we have a “holy half-hour” at 7:30. This is followed by breakfast and then a formation session with father. Next we have ora et labora time which is slave labor when the guys help father with different tasks around the site such as shoveling in the winter, taking the dock in and out, cleaning brush, that type of stuff. The girls help the sisters with things as well, although I’m not exactly sure what they do (as I am not a girl). After that, we say a rosary and then have Mass, followed by lunch. The afternoon changes from expedition to expedition. Sometimes we go hiking, sometimes we stay around the retreat center and go in the lake (water skiing, anyone? ), play sports, or anything else father can think of. After we wear ourselves out, we have dinner which is followed by a “night of prayer” as they call it, which is adoration/confession/benediction. We then usually get together and recap the day a little bit, before some free time and then off to bed. In the summer, there is a second full day and then we don’t have another night of prayer. Instead, it’s usually some free time and time for field games and the like.